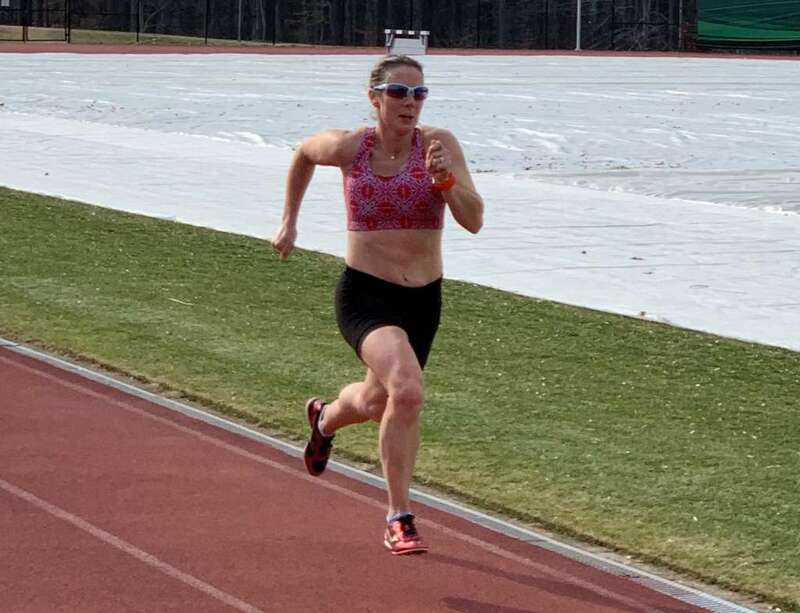 Gruendel has been training for April 15’s Boston Marathon, and she hopes to set a personal record. This will be her fourth marathon, and she ran her PR of 2:54-something at her first one in 2005. “I’m hoping to run 2:54 and a little change faster than whatever my change is,” she said. 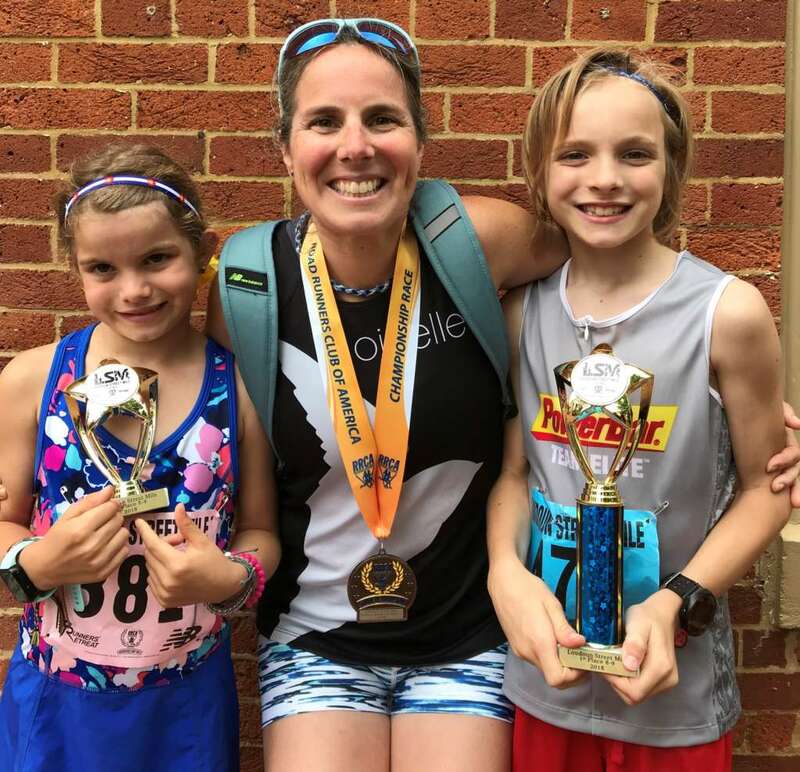 Gruendel, who grew up in Alexandria and graduated from Annandale High School, was able to run her second-fastest half marathon this March at the Shamrock Half Marathon in Virginia Beach. Her time was 1:25:24 — a 6:31 average pace. Neither Gruendel nor her husband have normal work schedules — she is an emergency medicine physician’s assistant for Commonwealth Emergency Physicians and he’s a firefighter. Their two children, Josef, 10, and Petra, 8, are busy with activities. And, Gruendel said, the family lives on a farm and has three miniature donkeys, a horse, two cats and a dog. Jackie Gruendel with daughter Petra and son Josef after the Loudoun Street Mile. She also had to work to get to where she is today. A few years ago, she didn’t run for about eight months as she recovered from back surgery, she said. Kendall Thompson trains with Gruendel six days a week. He’s a retired firefighter, so he works with her schedule, he said. He said they’d run together back in about 2001, but more recently started training together when she was coming back from her back surgery. He offered to walk with her. “I was willing to walk with, I never prepared to run with, her as fast as we’ve been running,” said Thompson, who is 53 and lives in Springfield. Gruendel encouraged him to run his first half marathon at Shamrock this year, where he was able to run the course in 1:32:03. He said he isn’t interested in running the marathon — but he didn’t plan to run a half marathon, either. “If I’m still running in four years, I’m sure I’ll have a couple of marathons under my belt thanks to Jackie Gruendel,” he said. Gruendel is also one of the leaders for the Oiselle Volée’s DMV — D.C., Maryland and Virginia — Team. Fellow team leader Caitlin Kovalkoski‘s first memory of Gruendel is hearing from one of the other leaders that Gruendel may be a contender to win the Marine Corps Marathon in 2015 and then seeing her run quickly up a hill during that race. Kovalkoski was volunteering at the event. Gruendel didn’t win, but she did come in as the 19th woman that year in a field that included more than 10,000 women. Now, they’ve become friends. Kovalkoski, 35, of Washington, recalled wanting to finish the George Washington Parkway Classic 5K in 2017 so she could see how Gruendel did — Gruendel ended up winning. And Gruendel also cares about how fellow runners’ workouts have gone, Kovalkoski said. “She just has this ability to make you care so much about your own efforts, too,” she said. Courtney Carter, 36, of Washington, another Oiselle Volée team leader for the DMV region, talked about how thoughtful Gruendel is. She said when she has a big race coming up, she’ll receive a box with cards, notes and gifts from Gruendel and her kids ahead of time. “She is a wonderful, wonderful friend and just a great person,” Carter said. And when it comes to running, she puts in the effort. “She’s a gifted runner, but she also works incredibly hard,” Carter said. Gruendel works with Dennis Barker, a coach based out of St. Paul, Minn. Although they’ve never met in person, they communicate through phone, text and email, he said. She’s great at communicating, Barker said, which is important. Although there is an overall training plan, he takes her feedback and uses that to shape future workouts. “Based on that, then we move forward and keep her healthy and progressing,” he said. Gruendel said she started working with Barker in September and has been building her base. She’s had training weeks of between 50 and 66 miles, and making everything fit with her other commitments can be tough. However, she will do what Barker says. She recalled there was one day she just could not fit in a long run, so Barker was able to move that run to another day. Thompson said Gruendel is a dedicated runner. “It’s amazing to me that someone who is a physician’s assistant at an emergency room department, full-time mom, full-time wife is able to do all these things on the little amounts of time that she has to get it done,” he said. 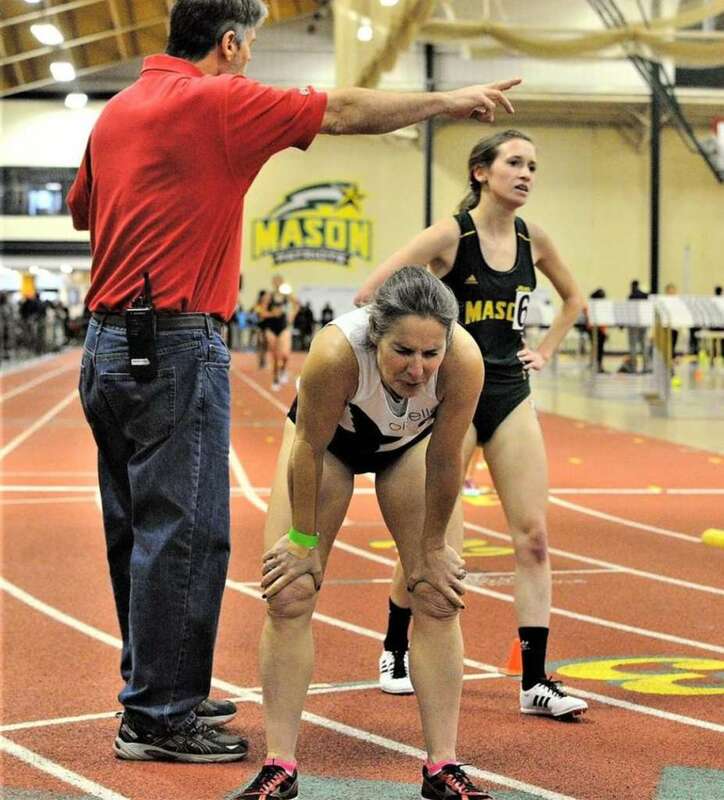 Jackie Gruendel works out at the George Mason University Track.